For a long time now, the Canadian government has been strongly promoting the Keystone XL tarsands export pipeline project. That includes an aggressive lobbying push, a "$16 million marketing campaign," and even labeling anti-Keystone activists as "threats to [Canada's] national security." The latest example of how hard the Canadian government has been pushing for this dirty, dangerous project was reported this week by the Wall Street Journal. Here's an excerpt. What is the likelihood that the following happened because the largest public relations firm in the world (Edelman) suddenly saw the light regarding its deep, extensive ties -- more than $327 million for 2008-2012 alone -- with the American Petroleum Institute (API), trade association for the oil industry? Or, more likely, perhaps it had to do with the bolded parts below? Here are five recommended reads for today (2/20/15). 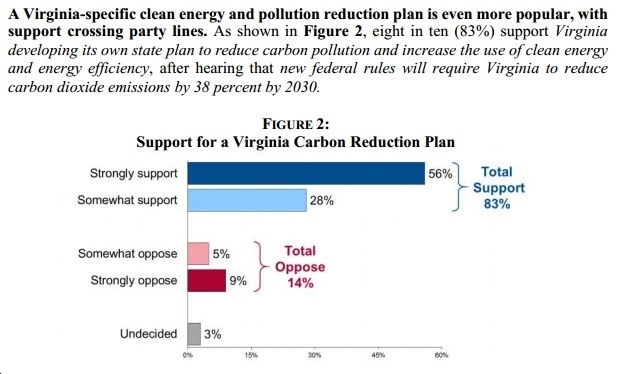 Another day, yet another poll showing massive, overwhelming support in a key state - Virginia in this case - for clean energy and carbon pollution reductions. The question, as always, is whether our elected officials will represent the wishes of the vast majority of their constituents, or whether they will go with the big money from wealthy, powerful fossil fuel interests? In considering this choice, they really might want to take a look at the results from this poll, as they are truly lopsided in support of clean energy and carbon pollution reduction.